Prog 2000 is a beautiful, a beautiful thing. Thats all. The cover is a remake of the original image which ocourred a day earlier and featured Hoagey, The Gronk, Starlord, Tornado, The big Ed, and G.B.H. hoisting up the flag. Burt took the original pic, but forgot to save it. Hmmm . . . prog 2000 . . . It was ok, it wasn't as good as a classic annual. The new Stront annoyed me. I thought he should have stayed dead and I did not like the updates. Nemesis was a really lame ending. Torquemada should have won, that would have been a really shocking end. I like some manga, but 士瑋's comics are a bit too far fetched for me. Although they wear similar armour to our 2000ad feminine heroes. I remember getting this for nostagia reasons (I'd stopped being a regular some years before). The slog inspired me to re-read it recently. I thought Nemesis was crap, with bad art and a lame story. I hated McMahons art on Dredd, which seemed rushed & crude, and was nothing like the way he drew the classic strips. I quite liked the Rogue Trooper NuEarth bit, and I enjoyed the Glimmer Rats. 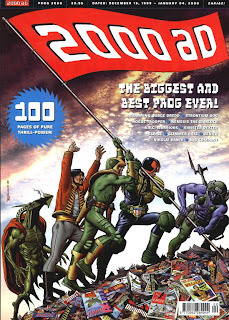 Colin, there are 2000 AD annuals that i find more beautiful, but yes, it is very attractive. Is that right, orLok? Tharg might have talked about that in the editorial but I skipped that bit. I agree with you re the annuals, Victor (see above) but not everything else. Nemesis finished fittingly but not spectacularly while i'm perfectly happy to see Johnny Alpha back. Hi Robert. I don't think it is as flat as successive end of year specials but it doesn't work as a stand alone because it runs wrap up of long runs and the start of new ones. I read this after many years away from the comic (peculiarly like the other Robert who has commented here - I nearly had deja vu). I remember there being some weird knock out tournament with every story battling it out for most powerful character (or something). I think Johnny Storm won, if memory serves, which I thought was ironic given that the character was dead. Yes, Robert, that tournament is there. It feels a tad out of place in this high-end production. It's more like a filler from the annuals.